05/01/2018 Kilen’s market-leading range of coil springs is now available from Loverock Motor Parts Ltd, who have been serving customers in Dudley and the Black Country for over 80 years. Having joined the UAN on January 1st, Loverock’s range now includes the top 200 Kilen coil spring references, offering 65% market coverage directly from the shelf, with room for further range expansion later this year. 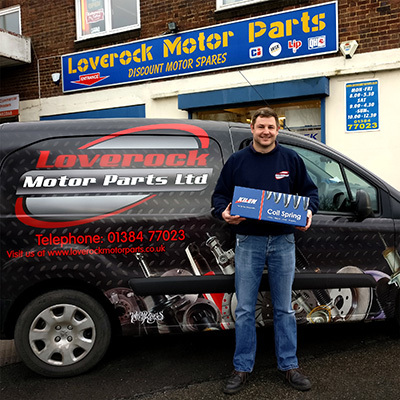 The Loverock family have been supplying car parts from their Brierley Hill premises since 1932, and today their fleet of vans offer same-day deliveries on a wide variety of products to garages and workshops across the West Midlands. Loverock Motor Parts will benefit from Kilen’s continuing range profiling and stock management support – a unique service offered to all Kilen stockists.